We have the opportunity to do something more than extend downtown or the Civic Center office district. Mid-Market has the potential to be a great cultural hub for our city. It’s already home to the American Conservatory Theater, Alonzo King LINES Ballet, Luggage Store Gallery, EXIT Theatre, Boxcar Theatre, Cutting Ball Theater, Gray Area Foundation for the Arts, KUNST-STOFF Contemporary Dance Company, the SHN theater company, CounterPULSE, The Black Rock Foundation (organizers of Burning Man) and Intersection for the Arts. Investing in expanded facilities and these organizations’ operational stability can help to create a unique district for arts and culture. ACT presents a particularly promising opportunity. The theater is exploring the development of a new $100 million performingarts center and drama school, along with student and artist housing. If constructed, this bold project would resurrect two long-dead blocks, reinvent the major gateway to the Mid-Market neighborhood, and send a jolt of confidence and energy throughout the surrounding area. This has worked elsewhere. Initiatives such as the PlayhouseSquare District Development Corp. in Cleveland and the Downtown Brooklyn Partnership in New York have raised hundreds of millions of dollars to invest in renovating old theaters, programming public spaces, and facilitating the development of commercial and residential real estate projects. The realization of this vision requires funding, however — which means we must develop the resources to acquire and safeguard key properties that can house our cultural treasures as well as stimulate additional investment and development. Attracting new businesses and retaining existing businesses requires investment. Several tools are needed to support a new Mid-Market arts district as well as to improve the public realm in the area. We need to establish either a redevelopment area or an infrastructure-financing district (IFD) to capture the new property tax value generated by the Twitter and CityPlace projects. Value increases from other new developments and businesses moving to the area should be captured as well. Tools such as an IFD or a redevelopment area would allow us to rely on these increases in property values as a future revenue stream to repay bonds for a variety of investments in the neighborhood, including the rehabilitation and development of buildings that support arts uses. The city can help make this type of financing easier to obtain and more attractive to use by serving as the bond issuer and helping arts organizations secure favorable terms from lenders. 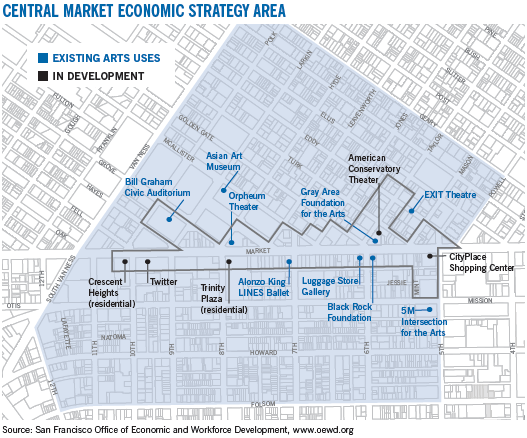 Capitalizing on the area’s concentration of arts organizations, the San Francisco Office of Economic and Workforce Development has launched an initiative to restore Mid-Market as the city’s downtown arts district. By encouraging new employers, retail and housing in a “focus area” along Market Street, the plan aims to serve and stabilize the larger neighborhood. The Mid-Market area is home to a significant stock of low-income housing, much of it owned by nonprofit organizations unlikely to convert it to market-rate housing. We need to find ways to protect and upgrade this affordable inventory to create more livable environments for low-income residents. This can include adding kitchens and bathrooms to traditional SRO units. At the same time, we should also promote market-rate housing, mixed-income housing and family-sized housing in order to attract a diversity of residents to the area. Finally, we should create more affordable housing in other areas of the city to reduce the pressure on the Tenderloin and Mid-Market neighborhoods and help them achieve more equitable development. Mid-Market needs more police officers on the streets to create a greater sense of public safety. The Tenderloin precinct was recently reduced by 17 officers. This will invariably result in weakened deterrence in a neighborhood that can ill afford it. There will be more incidents involving public disorder, and we could lose the progress achieved thus far in this critical component of a livable neighborhood. Two new community efforts are working to move the crack dealing on Turk Street and prescription-pill dealing on Leavenworth Street out of the neighborhood. Both deserve support from community-based organizations, the San Francisco Police Department, the Community Justice Center and the District Attorney’s Office. Programs that take chronic inebriates off the streets and provide treatment and other services also are critical. While such programs are expensive, the costs would be off set by the reduction in 911 calls and emergency treatment. The real progress already made in the Mid- Market area places us at a crossroads. If we are willing to invest in this area and develop creative policies, we can solve problems that have been plaguing the city for decades. Elvin Padilla, Jr. is the executive director of the Tenderloin Economic Development Project. A resident of the Tenderloin, his favorite neighborhood eating spots include farmerbrown (gumbo), Soluna Cafe (burgers), Morty's Deli (hot pastrami), Lers Ros (Thai), Mangosteen (Vietnamese), Urban Tavern (hot pretzels) and Taqueria Castillo.